Hazrath SYED SHAHUL HAMEED QADIRI ( QADIRI ) QADIR WALI is direct 22nd Decentant of Halarath Syedina Shah Ahmed Mujthaba Muhammad Mustafa (Sallalahu Alaihi wassalam) And 9th Direct Decentant from Halarath Syed Mohideen Shaik Abdul kaadhir Jeelani bagdhahi Raliyallahu thaalanahu. Hazrath SYED SHAHUL HAMEED QADIRI ( QADIRI ) QADIR WALI – Mazhar sheriff Located in Nagore, South India- THE Dargah is located 78 km from Thanjavur / 300 KM from Chennai ( Madras _ . The tomb is almost MORE THAN 500 years old and is topped by a golden dome and flanked by 5 minarets. It is just 4 km to the north of Nagapattinam. Nagore (sometimes spelled Nagoor) is a town in the Nagapattinam District, Tamil Nadu, India. It is located approximately 4 km north of the city of Nagapattinam. Nagore has a population of approximately 30,000. 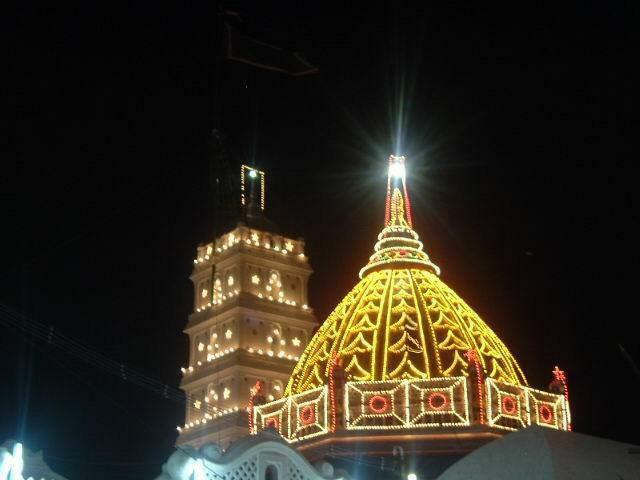 A prominent five-acre dargah (Muslim shrine) dedicated to the 16th century saint Nagore Andavar (literally “the Lord of Andavar”; also popularly called Meeran Sahib or Qadir Wali) is located there, and serves as a pilgrim center. 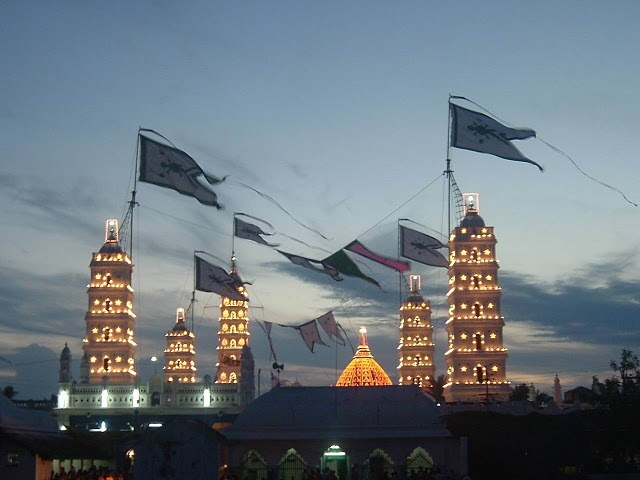 The 14-day Kandhuri Urs (also spelled Kandoori or Kandhoori) festival, dedicated to the saint, is held there annually. A brief History of the Holy Saint His Holiness Hazarath SYED SHAHUL HAMEED QADIRI ( QADIRI ) QADIR WALI GHANJASAVOY,GHANJABAKSH NAGORI, of Nagore Dargah ( Nagore Dargah) Sheriff. After more than a decade of training, he left Gwalior and went to Manickkapur with a bunch of 404 disciples and then toured extensively with his disciples in Afghanistan, Balusistan and other places of the world performing innumerable miracles on the way by raising the dead, making the dump to speak and the lamb to walk and by curing all kinds of incurable diseases. Accordingly the King dedicated 30 acres of land called ‘Heavenly’ and submitted the same to the Holy Saint on which the present buildings and premises of “Nagore Dargah shrine” stands. He remained in the place till the end of his life with his son.As per his instruction his son Hazarath SYED MOHAMMED YOOSUF SAHIB married SYED SULTAN BEEVI AMMA SAHIBA Daughter of Khaja Mahadoom-ul-Yamani of west Nagore. He got eight children-six males and two daughters. The people of all religion are visiting Nagore Dargah daily to get the blessings of the Holy saint with out any distinction.The Nagore Dargah is an object of Great veneration not only for Muslims but also for people of other religions.The Holy Saint came to Nagore on Thursday. So every Thursday large congregation of pilgrims visit the Dargah and make their offerings to the Holy Saint.